A study showed that about 31 per cent of South Africa's workers are part of what is called the informal economy. This includes people who do not have the necessary skills to be in full-time, secure, jobs. They run small, informal businesses and lack money to make their businesses grow. One of the major aims of the Accelerated and Shared Growth Initiative of South Africa (AsgiSA) is to close the gap between the First Economy and the Second Economy. In his State of the Nation address in February this year, President Thabo Mbeki said the struggle to get rid of poverty will continue to be an important part of government's effort to build the new South Africa. To help government fight poverty, the Department of Trade and Industry has programmes and agencies to help people grow their small businesses. The agencies support them with money, business skills, markets and technology to run their businesses. The department's agencies include the Small Enterprise Development Agency (seda), the South African Micro-Finance Apex Fund (samaf), Khula Enterprise Finance, the South African Women Entrepreneur's Network (SAWEN) and the National Empowerment Fund (NEF). 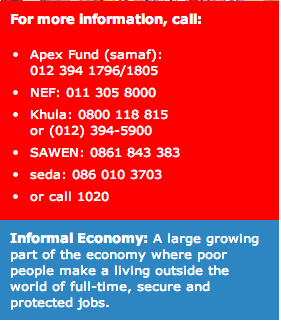 The Apex Fund is a company started by government to help reduce unemployment and poverty by supporting entrepreneurs. They give loans of up to R10 000 to people starting up small businesses. The Fund also encourages people to save money through savings plans like burial societies and stokvels. The NEF was started by government to help previously disadvantaged people to grow businesses started and run by them. Depending on the kind of business and its size, it will give from R250 000 up to R50 million. Khula Enterprise helps small, medium and very small enterprises or projects to get loans from financial institutions like banks. Through its Thuso Mentorship Programme, Khula also gives mentorship services to guide and advise entrepreneurs on how to manage their businesses. Women often face problems when they want to start their own businesses. SAWEN is an agency that specifically helps women start, run and grow their businesses. SAWEN brings together women entrepreneurs and get government and private institutions to support them. Seda was started in December 2004. Its role includes the support of co-operative enterprises, particularly those in rural areas. Many poor people in the rural areas are ready and willing to start their own businesses to create jobs and fight poverty, but they lack information on how to do so. 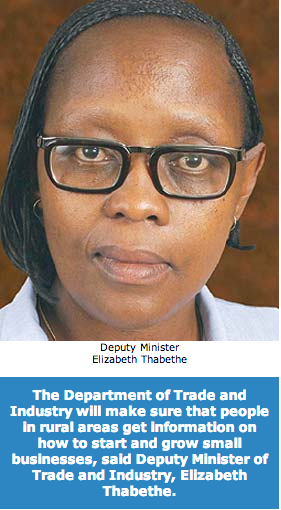 The Deputy Minister told Vuk'uzenzele it was an important goal of the Department of Trade and Industry to inform people about the economic opportunities that are available to them. Everyone should know how to start a business. She said the department has been undertaking road shows countrywide to inform people how to register and start their own businesses. Speaking about the department's agencies, she said some of these have been started specifically to help women, but very few women knew about them. "We have heard of organisations charging people up to R4 000 to register businesses when they can spend less than R500 if they do it through the offices of the Department of Trade and Industry. It is difficult for us to act against those organisations because there is no law to stop them. Those organisations know that many people are willing to pay a lot of money because they are not aware that they are being charged too much", Thabethe said. She said the department planned to increase the number of offices in the provinces to make it easier for the many people in rural areas to get the information they needed. They realised that people would understand the information better in their own languages. 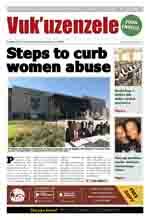 The department would therefore make sure that it would be available in all the official languages. "We are now distributing pamphlets in languages spoken in the area we visit, and will also speak to them in their own languages. We have visited all the provinces, informing them about our different agencies" she said.